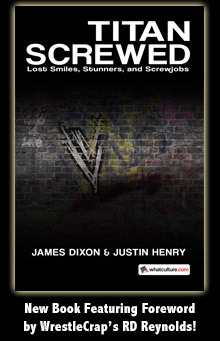 Headlies: “I'm A Dixie Carter Guy” T-shirts Not Selling As Well As Expected - WrestleCrap - The Very Worst of Pro Wrestling! 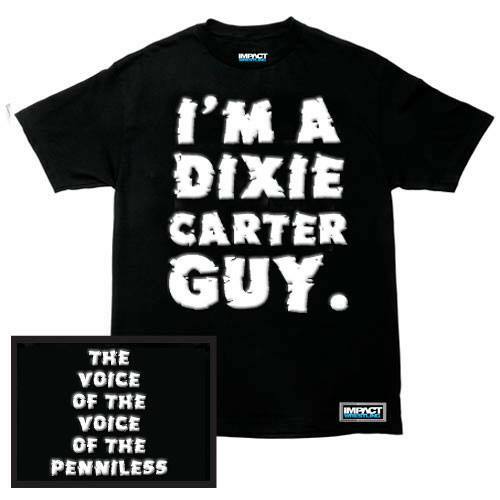 Nashville, TN – Despite being available for several months online and being sold at every live event, sales of TNA’s “I’m A Dixie Carter Guy” t-shirts have been very disappointing. Dixie’s questions were answered with a low murmur from the group. An awkward silence hung over the air as Carter’s eyes scanned the room. Gunner shifted in his seat uncomfortably while Rob Terry stared at his shoes. ODB took a large swig from her flask and shook her head in disbelief. Eric Bischoff then whispered something in Dixie’s ear. 4 Responses to "Headlies: “I’m A Dixie Carter Guy” T-shirts Not Selling As Well As Expected"
Rob Terry staring at his shoes made me lol. Could totally see this happening.